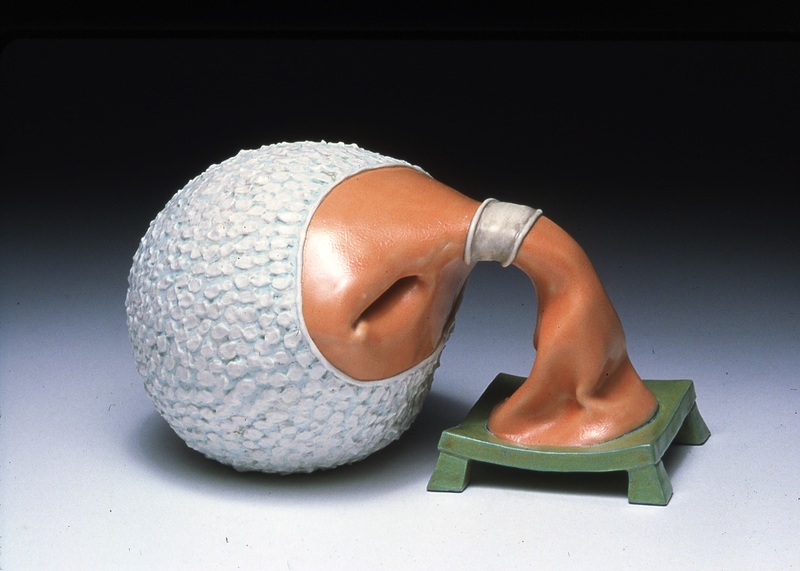 Kathy Butterly, Heavy Head, 2003, clay and glaze, 3 3/8 x 6/3 inches. For its participation in Open Spaces: A Kansas City Arts Experience, Kemper Museum presents a combination of new and older works by New York-based artist Kathy Butterly. Since the early 1990s, Butterly (b. 1963) has created distinctly evocative sculptures that contribute to and expand upon the tradition of studio ceramics. Through her practice, Butterly engages with concepts ranging from scale, materiality, and line to the history of the handmade vessel. She uses traditional ceramic forms as her starting point, referring to these formal templates as her “canvas.” Contorting and misshaping these structures through painstaking, delicate construction, she then adds layer upon layer of glaze, and fires the works repeatedly, causing some glazes to recede and others to burst into view. By way of their intimate scale, Butterly’s sculptures invite the viewer to move in and take a closer look, awakening our latent curiosity about the labor-intensive process required to produce such intricate creations. This is Butterly’s first one-person solo museum exhibition in the Midwest, and was co-organized by Erin Dziedzic and Dan Cameron, in generous collaboration with James Cohan Gallery, New York, and Byron C. Cohen Gallery, Kansas City.